A town and parish situated about three-quarters of a mile from Assisi. The town, numbering about 2000 inhabitants and officially known as Santa Maria degli Angeli, has grown up around the church (basilica) of Our Lady of the Angels and the adjoining Franciscan monastery. It was here that on 24 Feb., 1208, St. Francis of Assisi recognized his vocation; here was for the most part his permanent abode, after the Benedictines (of the Cluny Congregation from about 1200) had presented him (about 1211) with the little chapel Portiuncula, i.e. a little portion (of land); here also he died on Saturday, 3 October, 1226. According to a legend, the existence of which can be traced back with certainty only to 1645, the little chapel of Portiuncula was erected under Pope Liberius (352-66) by hermits from the Valley of Josaphat, who had brought thither relics from the grave of the Blessed Virgin. The same legend relates that the chapel passed into the possession of St. Benedict in 516. It was known as Our Lady of the Valley of Josaphat or of the Angels -- the latter title referring, according to some, to Our Lady's ascent into heaven accompanied by angels (Assumption B.M.V. ); a better founded opinion attributes the name to the singing of angels which had been frequently heard there. However this may be, here or in this neighbourhood was the cradle of the Franciscan Order, and on his death-bed St. Francis recommended the chapel to the faithful protection and care of his brethren. Concerning the form and plan of the first monastery built near the chapel we have no information, nor is the exact form of the loggia or platforms built round the chapel itself, or of the choir for the brothers built behind it, known. Shortly after 1290, the chapel, which measured only about twenty-two feet by thirteen and a half, became entirely inadequate to accommodate the throngs of pilgrims. The altar piece, an Annunciation, was painted by the priest, Hilarius of Viterbo, in 1393. The monastery was at most the residence, only for a short time, of the ministers-general of the order after St. Francis. In 1415 it first became associated with the Regular Observance, in the care of which it remains to the present day. The buildings, which had been gradually added to, around the shrine were taken down by order of Pius V (1566-72), except the cell in which St. Francis had died, and were replaced by a large basilica in contemporary style. The new edifice was erected over the cell just mentioned and over the Portiuncula chapel, which is situated immediately under the cupola. The basilica, which has three naves and a circle of chapels extending along the entire length of the aisles, was completed (1569-78) according to the plans of Jacob Barozzi, named Vignola (1507-73), assisted by Alessi Galeazzo (1512-72). The Doric order was chosen. The basilica forms a Latin cross 416 feet long by 210 feet wide; above the middle of the transept rises the magnificent cupola, flanked by a single side-tower, the second never having been finished. In the night of 15 March, 1832, the arch of the three naves and of the choir fell in, in consequence of an earthquake, but the cupola escaped with a big crack. Gregory XVI had all restored (1836-40), and on 8 Sept., 1840, the basilica was reconsecrated by Cardinal Lambruschini. By Brief of 11 April, 1909, Pius X raised it to a "patriarchal basilica and papal chapel". The high altar was therefore immediately rebuilt at the expense of the Franciscan province of the Holy Cross (also known as the Saxon province), and a papal throne added. The new altar was solemnly consecrated by Cardinal De Lai on 7 Dec., 1910. Under the bay of the choir, resting against the columns of the cupola, is still preserved the cell in which St. Francis died, while, a little behind the sacristy, is the spot where the saint, during a temptation, is said to have rolled in a briar-bush, which was then changed into thornless roses. During this same night the saint received the Portiuncula Indulgence. 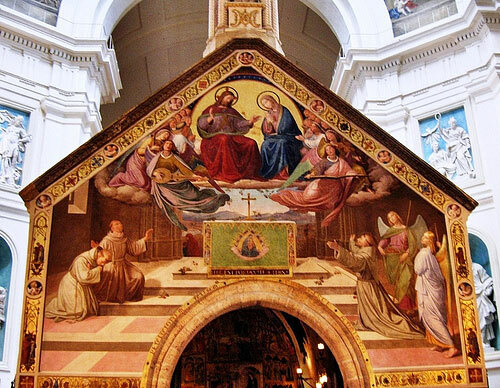 The representation of the reception of this Indulgence on the façade of the Portiuncula chapel, the work of Fr. Overbeck (1829), enjoys great celebrity. While the declarations of the popes have rendered the Portiuncula Indulgence certain and indisputable from the juridico-canonistic standpoint, its historical authenticity (sc. origin from St. Francis) is still a subject of dispute. The controversy arises from the fact that none of the old legends of St. Francis mentions the Indulgence, and no contemporary document or mention of it has down to us. The oldest document dealing with the Indulgence is a notary's deed of 31 October, 1277, in which Blessed Benedict of Arezzo, whom St. Francis himself received into the order, testifies that he had been informed by Brother Masseo, a companion of St. Francis, of the granting of the Indulgence by Honorius III at Perugia. Then follow other testimonies, for example, those of Jacob Cappoli concerning Brother Leo, of Fr. Oddo of Aquasparta, Peter Zalfani, Peter John Olivi (d. 1298, who wrote a scholastic tract in defence of this indulgence about 1279), Blessed John of Laverna (Fermo; d. 1322), Ubertinus of Casale (d. after 1335), Blessed Francis of Fabriano (d. 1322), whose testimony goes back to the year 1268, etc. In addition to these rather curt and concise testimonies there are others which relate all details in connection with the granting of the Indulgence, and were reproduced in numberless books: e.g. the testimony of Michael Bernardi, the letters of Bishop Theobald of Assisi (1296-1329) and of his successor Conrad Andreae (1329-37). All the testimonies were collected by Fr. Francesco Bartholi della Rossa in a special work, "Tractatus de Indulgentia S. Mariae de Portiuncula" (ed. Sabatier, Paris, 1900). In his edition of this work, Sabatier defends the Indulgence, although in his world-famous "Vie de S. François" (Paris, 1894), he had denied its historicity (412 sqq. ); he explains the silence of St. Francis and his companions and biographers as due to reasons of discretion etc. Others seek to accord more weight to the later testimonies by accentuating their connection with the first generation of the order; others again find allusions to the Indulgence in the old legends of St. Francis. On the other hand, the opponents regard the gap between 1216 and 1277 as unbridgable, and hold that the grounds brought forward by the defenders to explain this silence had vanished long before the latter date. No new documents have been found recently in favour of the authenticity of the Indulgence.